A 41-year-old woman with newly diagnosed hypertension reports persistent bilateral flank pain. She gives a family history of “kidney problems.” On urinalysis, she is noted to have microscopic hematuria. An ultrasound and abdominal CT scan show bilateral polycystic kidneys. Introduction: Polycystic kidney disease (PKD) is a manifestation of a group of inherited disorders resulting in renal cyst development. In the most common form, autosomal-dominant polycystic kidney disease (ADPKD), extensive epithelial-lined cysts develop in the kidney; in some cases, abnormalities also occur in the liver, pancreas, brain, arterial blood vessels, or a combination of these sites. It is the most common tubular disorder of the kidney, affecting 1 in 300 individuals. It is most frequently seen in the third and fourth decades of life, but can be diagnosed at any age. Pathophysiology: ADPKD results from mutations in either of 2 genes that encode plasma membrane–spanning polycystin 1 (PKD1) and polycystin 2 (PKD2).2 Polycystins regulate tubular and vascular development in the kidneys and other organs (liver, brain, heart, and pancreas). PKD1 and PKD2 are colocalized in primary cilia and appear to mediate Ca2+ signaling as a mechanosensor, essential for maintaining the differentiated state of epithelia lining tubules in the kidney and biliary tract. These mutations result in many abnormalities including increased proliferation and apoptosis and loss of differentiation and polarity. of duct-lumen architecture of epithelium. • Chronic flank pain as a result of the mass effect of enlarged kidneys. • Acute pain with infection, obstruction, or hemorrhage into a cyst. • Hypertension is common in adults (75%) and may be present in 10% to 30% of children. • Kidney stones (calcium oxalate and uric acid) develop in 15% to 20% of affected individuals because of urinary stasis from distortion of the collecting system, low urine pH, and low urinary citrate. • Nocturia may also be present from impaired renal concentrating ability. • Obtain a urinalysis to document hematuria and a complete blood count or hemoglobin to identify anemia. 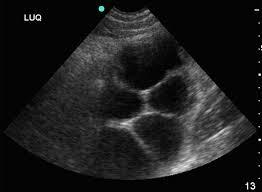 • Diagnosis is often made with ultrasound. More than 80% of patients have cysts present by age 20 years and 100% by age 30 years. • Cysts are commonly found in the liver (50% to 80%) spleen, pancreas, and ovaries. • The diagnosis of PKD can usually be made from ultrasound characteristics, the presence or absence of extrarenal abnormalities, and screening of parents older than 40 years of age. • Simple cyst—Diagnosed at any age; few cysts seen; benign features. • Acquired cystic disease—Diagnosed in adulthood; few to many cysts; cyst development preceded by renal failure. • Tuberous sclerosis—Diagnosed at any age; few to many renal angiomyolipomas; inherited nonmalignant tumors grow in the skin, brain/nervous system, kidneys, and heart. Management: The current role of therapy in Polycystic Kidney Disease is to slow the rate of progression of renal disease and minimize symptoms. • For episodes of gross hematuria, bed rest, analgesics, and hydration is recommended and is sufficient to increase the urinary flow rate to 2 to 3 L/day; hematuria generally declines to microscopic levels in a few days. patients with chronic kidney disease and hypertension. • Treat infection as early as possible. If pyocyst is suspected, agents that penetrate cysts such as trimethoprim-sulfamethoxazole, chloramphenicol, and ciprofloxacin are used. •Cyst puncture and a sclerosing agent (i.e., ethanol) can be used in painful cysts. Dialysis And transplantation: For patients with End Stage Renal Disease as a result of PKD, transplantation and dialysis are options. A Child With Palpable Purpura on Lower Limbs.